Zurich, Switzerland: – Fast-growing pharma CDMO VIO Chemicals has used an interview at the recent CPhI Worldwide expo in Frankfurt to herald imminent new product and research offerings. 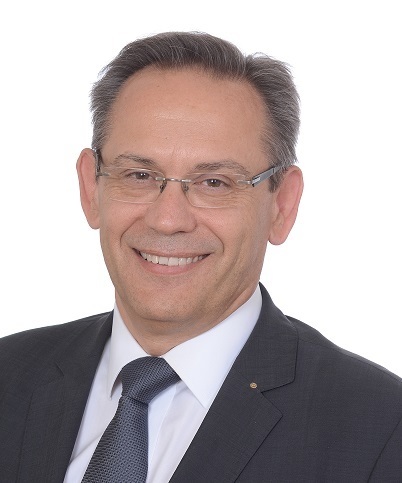 VIO Chemicals CEO and Founder Dimitris Kalias was featured in a “Five Minutes with…” CPhI interview during which he talked about the company’s recent expansion and revealed its upcoming plans. “In addition to the usual chemical technologies in our toolbox, recently we have developed and implemented asymmetric biocatalysis to expand our range of stereoselective options,” said Dr. Kalias. “In the meanwhile, we are still working with other catalytic systems, taking into account the exact chemistry on a case-by-case basis and the balance between the cost and the efficiency of the process”. Kalias went on to highlight the combination of scientific expertise and technical infrastructure as a major advantage in special product areas: “We also have significant experience in the efficient production and purification of oils and liquids, assisted by our distillation and solvent recovery capabilities”. Kalias revealed that VIO would launch a new project in 2018 based on flow chemistry and photochemistry. “We developed the process in Greece, based on Bicyclo [1.1.1] pentane intermediates. I cannot disclose much more at the moment but I can tell you that the big pharma companies are very excited about this type of products,” he noted. The CEO said VIO was poised to introduce new products based on its expertise in carbohydrate chemistry. He also mentioned VIO’s marketing vision to expand its services to emerging sectors in need of new advanced proprietary products and to serve more new regions around the world. 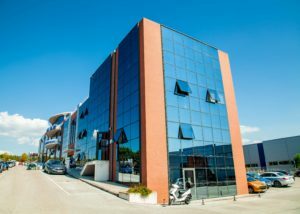 Kalias said the past year had been “a very important milestone for VIO Chemicals” with the setting up of its own R&D centre in Thessaloniki, Greece. The centre currently employs some 35 people, including 15 scientists working in chemical synthesis, 10 in analytical research and development and a further 10 in quality assurance, regulatory affairs and intellectual property issues. “We chose to found our R&D hub in Greece because of the very high scientific output and innovation level compared to China, as well as the low development costs compared against other European countries,” Kalias explained. Processes developed at the Thessaloniki R&D centre are technology transferred, implemented and up scaled at the VIO manufacturing plant in Binhai or at third-party production units. Dr. Kalias said the decision to manufacture in China was initially driven by factors such as cost and tax advantages. “However, nowadays, our main driver is the availability of raw materials, and China is in possession of a vast territory with an abundance of raw materials as a source of input for its large manufacturing industry,” he noted. “Nevertheless, this year there has been a decline in the availability of raw materials because many suppliers were not compliant with local environmental regulations. Although our business has been affected to some extent, we have managed to avoid any regulatory obstacles thanks to our proactive approach and investment in waste treatment technology,” said Dr. Kalias. ”Compliance with local health, safety and environmental regulations is imperative for our business and a major driver for our reliability towards our customers; they certainly do not want to see their products appear on any newspaper headline being associated with some chemical waste pollution,” he commented. The Frankfurt expo also marked the rolling out of VIO’s new visual brand identity, logo and dynamic website that provides a searchable portal for the company’s portfolio of more than 350 ready-to-order products for pharmaceutical and chemical applications. The new VIO Chemicals ‘look’ is designed to emphasize the company’s competencies and aspirations and help widen its appeal and accessibility. 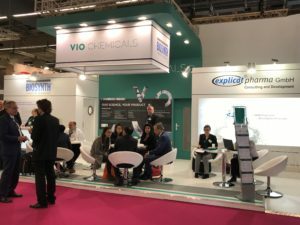 The new brand image was also evident in the look of the VIO Chemicals display as part of the Fine Chemicals and Intermediates Zone of CPhI at Frankfurt Messe. VIO Chemicals specializes in custom design and production of specialty chemicals, intermediates and active pharmaceutical ingredients (APIs). The company offers a complete range of services, from process and product research and development to quality control and production in commercial quantities. Through its ISO 9001 & ISO 14001-certified R&D centre in Greece and three production facilities in China, one cGMP-standard, VIO Chemicals applies cutting-edge science and uses novel technologies to optimize product quality and maximize API capabilities. In addition, the company is specialized in strategic sourcing of catalogue, custom-manufactured and proprietary products, offering complementary GMP/EHS auditing, consulting and regulatory services. Founded in Zurich in 2001, VIO Chemicals is the exclusive and trusted partner for customers and suppliers in the chemical and pharmaceutical industry worldwide. To learn more, visit http://www.viochemicals.com. Click on VIO Chemicals CEO discusses 2018 plans for other information. Click on Five Minutes at CPhI with Dimitris Kalias to see full interview.